SENRUG began in 2003 when a small group of people committed to campaigning for better rail services were given a start-up grant of £50 from Getabout RTP. Over the next few months a committee was formed and a constitution drawn up, and the first annual general meeting was held at Morpeth Town Hall on 22nd March 2004, at which the constitution was accepted and working committee confirmed. Denis Murphy, at the time MP for Wansbeck, came to the first meeting to offer his support. SENRUG’s first Chair was Ken Allott, who had been campaigning for better rail services personally for some time, particular for those with mobility problems since Ken himself had recently been diagnosed with Motor Neurone Disease and used a wheelchair. In March 2005 SENRUG Committee Member Trevor Watson put forward modest proposals to re-open the Ashington Blyth & Tyne line to passenger train in phases, starting with the Morpeth – Choppington – Bedlington section. The plan came to the attention of The North East Assembly who carried out technical feasibility studies which confirmed the plan was both viable and cost justified. More success came in December 2005 when SENRUG persuaded CrossCountry, at the time operated by Virgin Trains, to stop some of their services at Morpeth. Two trains in each direction were provided initially; this was soon increased to 4 each way. Sadly the next Department for Transport franchise specification only required the new operator who took over the route from November 2007 to maintain the 2 trains each way per day, though Arriva, who won the franchise, have held it at 3. In Summer 2006 Dennis Fancett was invited to take over as Chair of SENRUG and over the next few years Dennis worked hard to turn the group into a respected campaign based organisation, wishing to avoid SENRUG being seen simply as a nostalgic or a complaint-focussed group. Dennis’ vision is to put forward ideas that are practical and viable and help rail companies by letting them know what’s actually happening on the ground and how their services can be improved, whilst being constructive and respecting their commercial constraints. 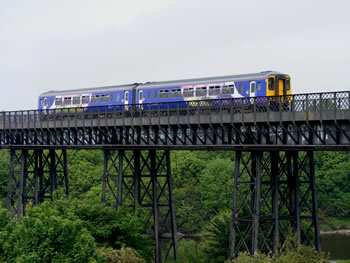 In 2008, with sponsorship from Go Wansbeck, the regeneration arm of the former Wansbeck District Council, SENRUG chartered a train from Northern Rail which made 3 trips round the Ashington Blyth and Tyne Line as far as Ashington. Tickets were placed on sale to members of the public for the 2nd and 3rd trip and sold out within hours; however the first trip was reserved exclusively for invited stakeholders: Councillors from various local authorities as well as Council staff members, the local MP and MEP, representatives from regeneration agencies, local businesses, Chamber of Commerce, the TUC and most importantly the press. The event was probably the pivotal moment in turning round both public opinion and more importantly the view of key stakeholder groups into thinking SENRUG’s re-opening campaign was both achievable and realistic. Northumberland County Council subsequently listed the scheme as their top public transport priority in their Local Transport Plan and are currently progressing it. The massive publicity generated by the charter firmly placed SENRUG on the radar as a respected organisation with a serious campaign agenda, and frequent press coverage of its activities and campaigns has followed. Today SENRUG continues to campaign for several different improvements in rail services, throughout the South East Northumberland area. SENRUG holds regular public meetings, normally in Morpeth, usually with a guest speaker from the rail industry followed by a question and answer session. SENRUG also publishes informative Newsletters containing a mixture of campaign updates, news from the train companies and tips and ideas for rail travel. Most of SENRUG’s campaigning work is done through emails, letters or meetings with train companies and other relevant organisations. However, in March 2010, just prior to the General Election, SENRUG held a political hustings meeting at which the candidates for the 3 main political parties all expressed their support for SENRUG’s work. Prior to that, on three occasions SENRUG Chair Dennis Fancett has been given the opportunity to present SENRUG’s campaign for re-opening the Ashington Blyth & Tyne Line to the Secretary of State or Under Secretary of State for Transport. In 2013, SENRUG was awarded Highly Commended status in the RailFuture Best Rail User Group Awards. In 2014, SENRUG received 3 further awards from RailFuture: Silver for Best Website and Best Newsletter, and a Judges Special Award for its Schools Competition.